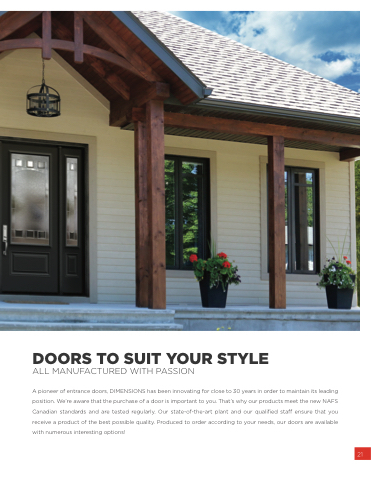 A pioneer of entrance doors, DIMENSIONS has been innovating for close to 30 years in order to maintain its leading position. We’re aware that the purchase of a door is important to you. That’s why our products meet the new NAFS Canadian standards and are tested regularly. Our state-of-the-art plant and our quali ed staff ensure that you receive a product of the best possible quality. Produced to order according to your needs, our doors are available with numerous interesting options!